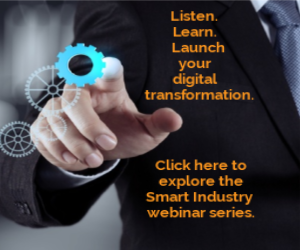 We have all heard the buzz around smart manufacturing for several years, fueled by the promises of IoT and the adoption of technologies such as cloud, mobility and analytics. Smart machines now take advantage of vendor technologies and aggregate the learnings from individual sensors and components into algorithms that mitigate downtime and provide prognostic and predictive diagnostics. These machines provide enhanced value to the end user through improved OEE optimized availability. And consider the adoption of technologies such as cloud, mobility and analytics. Smart machines now take advantage of vendor technologies and aggregate the learnings from individual sensors and components into algorithms that mitigate downtime and provide prognostic and predictive diagnostics. These machines provide enhanced value to the end user through improved OEE optimized availability. But even a smart machine has conditions that change over time. Due to mechanical degradation, product changeovers or operating conditions, it becomes advantageous for the control components to auto-correct within acceptable limits, performing longer, running diagnostics and anticipating conditions for potential quality or reliability issues. The ability of individual components to monitor and correct aberrant behaviors is critical to running production at full speed with less operator intervention, and less lost production and downtime. Beyond just compensating for failure, however, is the ability to learn what normal anomalies exist on a machine, such as vibration under acceleration, a temporarily unstable load, or even a vibration in the base of the machine while under load. As a use case, we consider the movement of a gantry system in an end-of-line operation. Normal vibration suppression is required for the accuracy of movement. These responses are predictive and sometimes repeatable. Limits outside of typical are monitored by the operator or remotely, indicating a more serious positioning error or mechanical degradation. When continuous auto-tuning and vibration suppression are deployed, limits are set and diagnostics and alarms monitored effectively, machine availability is optimized. When applying vibration suppression, typically the limits are set such that the control system is monitoring and responding by adjusting production or advising operators and maintenance of impending issues. Production can be slowed or stopped depending on alarm modes. In many cases, pre-configured alarm screens on the operator interface are mirrored on a mobile device so that all responsible personnel are advised simultaneously. Likewise, trending of these anomalies can be visualized and stored either on premise or to the cloud for pattern matching or fleet comparisons to determine whether a persistent service issue exists or if a given anomaly is typical for a specific product run. OEMs are finding it advantageous to perform analysis on these anomalies to enhance service offerings or anticipate needs in consumables and spare parts. In the case where we have deployed these servo technologies, we find that thresholds and alarms are intelligently learned by the system, and can be used as predictive-failure setpoints, improving machine availability by avoiding unnecessary shutdowns. We have also seen improved throughput due to shorter cycle times, shorter settling times and higher accuracy. Also, since the servo is using torque-sensing technology, additional sensors are not required, thereby saving device and installation costs. Smart machines require less human intervention for runtime and maintenance, improve overall availability and production efficiencies, and integrate easily with business systems to ensure demand is met just in time and is integrated tightly with supply chain-management objectives and systems. Users faced with increasing margin pressures, operator-skill challenges, and the impact of immediate-demand requirements are increasingly expecting integrated smart machines that can operate autonomously while communicating upstream to ensure demand is met, quality is guaranteed, and losses are minimized. Elaine Wang is a senior product marketing engineer with Mitsubishi.